Hi, everyone. I’m happy to join you again on Jenny’s blog and with the warmer weather isn’t it great to be welcoming Spring into our lives! Outdoor activities, spring cleaning and of course, fresh Spring foods! And nothing does this better than asparagus so I’ve made a healthy, easy dish for you today that is ready in 30 minutes! We have to wonder how we accomplish all that we do each day because when we wake up and do a checklist first thing in the morning it seems darn near impossible to get it all done! This quick dinner crosses off one of those chores because anyone can prepare this – even if you have a partner that doesn’t know how to cook. It’s really all a matter of chopping, assembling and tossing in the oven. So no excuses from the non-cookers in the family! 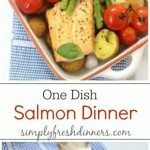 If you want to keep this meal budget friendly, buy frozen salmon but be sure to take it out the night before. I recommend always buying frozen fish if you don’t live near the shore. They flash freeze most fish right on the boat these days so most times this will have a better taste than what you find in the ‘fresh caught’ section. The trick is to find a good quality company producing frozen fish and that may require trying a few brands and letting your family be the taste testers. Cook your mini-potatoes first and then pile in the ingredients and let the oven do the rest. This recipe has all the flavors to please even the pickiest eaters and when it comes to clean up no one is going to battle over cleaning up one dish – right? Ok, I know…there’s always one who will complain, lol. Solve that problem ahead of time by suggesting that the one who doesn’t help with prep can do clean-up. Now if you have little ones, well, can’t help you there but at least the mess is minimal! 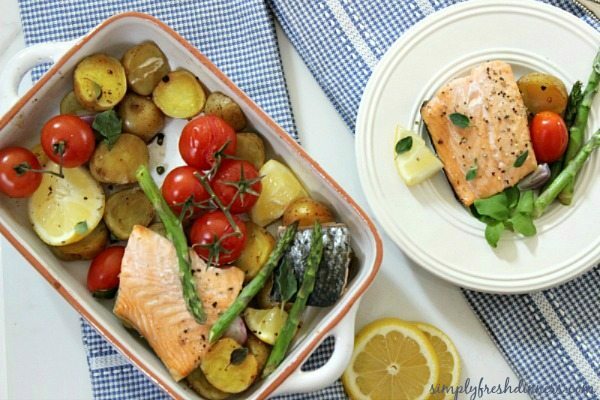 The tomatoes will burst and spread their yummy flavors over your dinner and the roasted lemon is perfect to squeeze on your salmon. Fresh basil added at the end finishes the touch of Spring on your plate. Living on Vancouver Island has created a passion for seafood for me and salmon is one of my very favorite dishes to make for lots of reasons. It’s super good for you, it’s easy and it’s almost fool proof when you bake it in the oven. 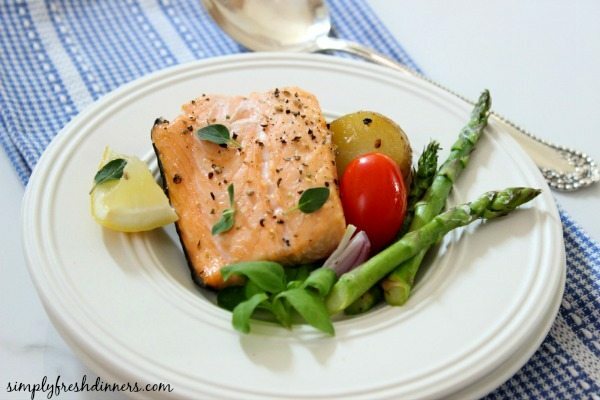 Mediterranean salmon is one of my very favorite because you just wrap it in foil, toss it in and forget it. If you’re a lover of smoked salmon, try adding it when you make a salmon burger. The flavors are complex and over the top – especially if you use your grill. Remove from oven and add remaining ingredients except for basil. 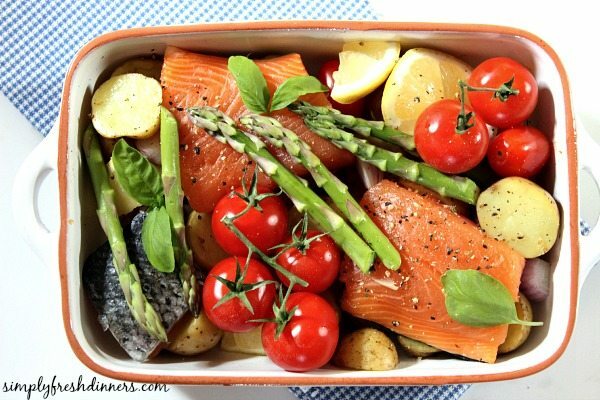 Nestle the salmon in amongst the vegetable and drizzle tomatoes and asparagus lightly with balsamic vinegar. Return to oven for an additional 12 minutes or until salmon is opaque and flaky. Remove from oven, squeeze two of the roasted lemon wedges over the salmon if desired. Top with fresh basil leaves and serve. Here’s some of my latest Spring recipes you may enjoy. See you again soon!